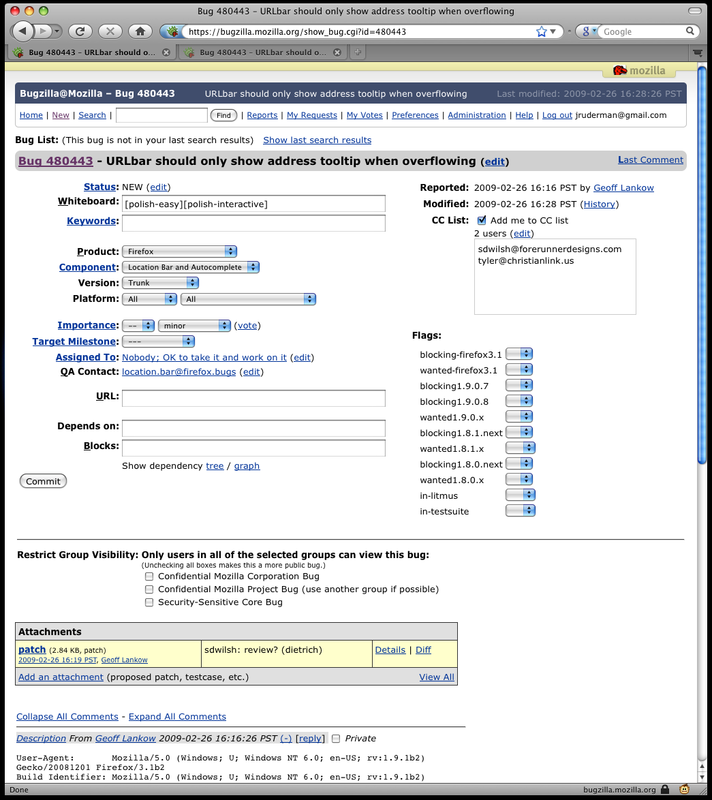 This entry was posted on Thursday, February 26th, 2009 at 10:27 pm	and is filed under Bug tracking, Mozilla, User Interfaces, User Scripts. You can follow any responses to this entry through the RSS 2.0 feed. Both comments and pings are currently closed. Much less noise = Good. Bugs without any flags cause an alert to show about getElementById(“flags”) being null. I put the snarfFlags() and showHideFlags(“none”) inside an if block checking document.getElementById(“flags”). Thanks, Ed. Should be fixed now. You’ll notice that 2/3rds of the page is blank to the right of the actual comments. Making the lines not wrap at 80 characters would save a huge amount of space. I meant to say only 2/3rds is used. There is 1/3rd to the right that is blank. I agree that this would be very very useful to incorporate into Bugzilla. It’s a lot more useful than the new collapse-comments script that *is* part of Bugzilla now. Obsolete attachments should definitely be hidden by default in Bugzilla. It’s the first thing I do when viewing a bug to save space. I made TidyBug work slightly better for users without editbugs (thanks to malte for pointing out that it required editbugs). I also implemented some suggestions from Brian Crowder: I made “show more” prettier and “show flags” toggleable. 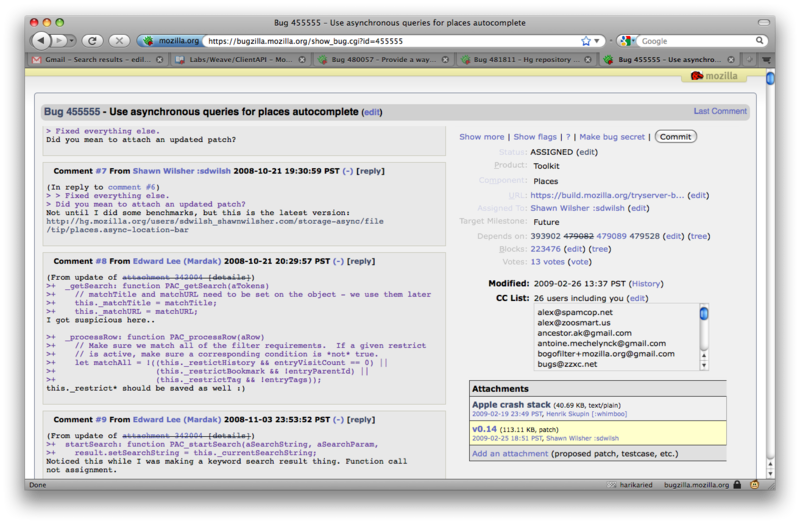 Obsolete attachments are already hidden by default in Bugzilla 3.4. About what should be displayed or not by default, it’s always the same story. Some fields which are useful to you are not necessary useful to me, and vice-versa. > Making the lines not wrap at 80 characters would save a huge amount of space. The title and fields will be fixed on the page nomatter where you scroll. This means the only things left that can scroll are the comments. So instead of needing to jump to the top to edit/check something after reading the comments, they’re available right away. I just installed and get the following error when attempting to run on a show_bug.cgi page.